Kingsland Drinks have been producing wines and spirits since 1955. Specialising in a complete category solution, they work with top producers around the world, as well as creating their own unique brands. Westgate had previously worked with Kingsland Drinks supplying them with Hoardfast; a part height partitioning system. Having been satisfied with the high level of service and the standard of the product, Westgate were approached by Kingsland Drinks about installing a full height, floor to ceiling partition in their existing storage warehouse in Manchester. The new enclosure would enable them to turn half the space into a production zone for a new bottling line. Having completed many projects for temperature and dust control in food and drink environments in the past, Westgate recommended Flexiwall to deliver the requirements of the project. Operating in the food and drink industry means that Kingsland Drinks must meet the requirements for BRC accreditation. 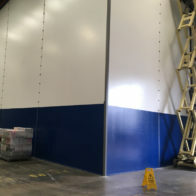 Flexiwall helps with this as it is manufactured from food safe materials, delivers an over 99% dust tight seal and easily segregates production and storage areas. Installations are quick and clean in comparison to traditional partitioning methods and Flexiwall only takes up millimetres of floor space: reducing the amount of space and the amount of downtime required whilst enabling operation schedules to continue during the planned installation. 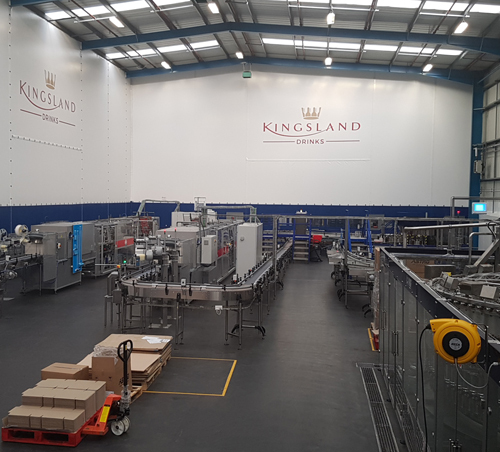 As well as the Flexiwall partition, which included vision panels, Westgate also installed three steel pedestrian doors and a Fastflex fast action door, providing Kingsland Drinks with an integrated solution from a single supplier. 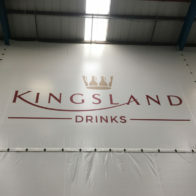 Kingsland Drinks also took advantage of being able to add their company logo to the Flexiwall, further enhancing the look of the partition and creating a corporate and branded environment for workers and visitors. Hoardfast PVC partitioning was used to create an office and storage room, within the enclosure.